Join us at PANERA on MONDAY, September 17! 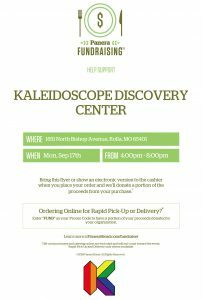 Stop by on Monday between 4-8pm, show them the flyer below and the Kaleidoscope Discovery Center will receive 20% of the proceeds from the evening! Enjoy a 4pm coffee and something sweet or come later for dinner! The KDC staff and board members are looking forward to meeting you and will be on hand to tell you more about our ongoing and upcoming programs. We look forward to seeing you then! Bring a friend! Please be ready to show the image below so that we get credit for your purchases.